When Hurricane Katrina struck the city, it was a category 3 storm, not an ultimate-fury category 5. Katrina's eye passed to the east. The winds would have been stronger and the storm surge higher had it passed to the west. 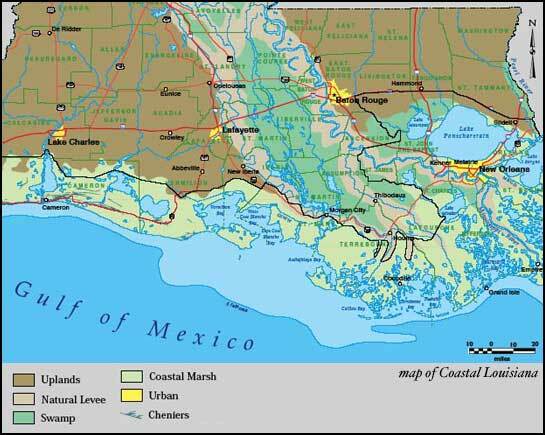 The failed levees were defending the city against flooding along the coast and in Lake Pontchartrain, not the much taller levees along the Mississippi River. "Imagine if the Mississippi River breaks through [the levees at New Orleans]," says Gerald Galloway, who worked on the upper Mississippi River as a general in the U.S. Army Corps of Engineers. "It would be like a fire hose." Granted, that's more likely to happen during a river flood than a hurricane, but, as Galloway says, "When we made the decision to protect New Orleans with levees, the goal was, 'Do your best to protect against the worst thing imaginable.' A Mississippi River and tributary flood, that's the biggy." Galloway is now a research professor of civil and environmental engineering at the University of Maryland. He was speaking before it became clear that levee failures caused most or all of the flooding in New Orleans. New Orleans has long been the prime case of an American disaster waiting to happen. "If there is any place that was programmed for a disaster, this is it," says J. David Rogers, a professor of geology at the University of Missouri-Rolla. "In the disaster business, this is the most expected kind of disaster for any city with a population of 500,000 and above." Plenty of hurricanes have come close to walloping the Big Easy. Since 1969, Rogers says, "We've had [hurricanes] Betsy, Camille, Carmen, and Georges." 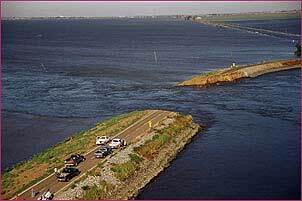 In 1998, Georges raised Lake Pontchartrain, to within three inches of the levee tops. "It told us in no uncertain terms that if there was a category 4 or 5 storm," and the eye passed just west of New Orleans, "we would lose it." Lose New Orleans, that is. Bad as it was, the catastrophe called Katrina came as no surprise to many experts, who have written repeated warnings about what would happen when a city that's below sea level was confronted with a 20-foot storm surge. "There is some act of God that will occur, that no one has conceived of, you can't do much about that," says Gerald Galloway. "But in this case, we perceived and conceived. It was a category 4 hurricane, and we knew exactly what it would do, and we did not protect against it." largely below sea level. The city is often described as a "bathtub" surrounded by an elaborate, expensive, and elderly series of levees (the failure of these levees is now seen as the major cause of the destructive flooding in New Orleans). losing protection from barrier islands and wetlands between the city and the Gulf of Mexico, which slow a hurricane's winds and reduce its storm surge. Louisiana is losing an estimated 34 square miles of land per year, the fastest wetland destruction in the nation. In another 50 or 100 years, New Orleans could have frontage directly on the Gulf. Can we enlist nature in protecting vulnerable coastal areas against high water? Are higher levees the whole answer?